We recently had some work done in our living room, adding french doors onto the garden where our window used to be and also taking our radiators off the wall and attaching new ones up the wall on the corners. In doing so we moved around a bunch of our furniture and bits and pieces and created a little reading corner. 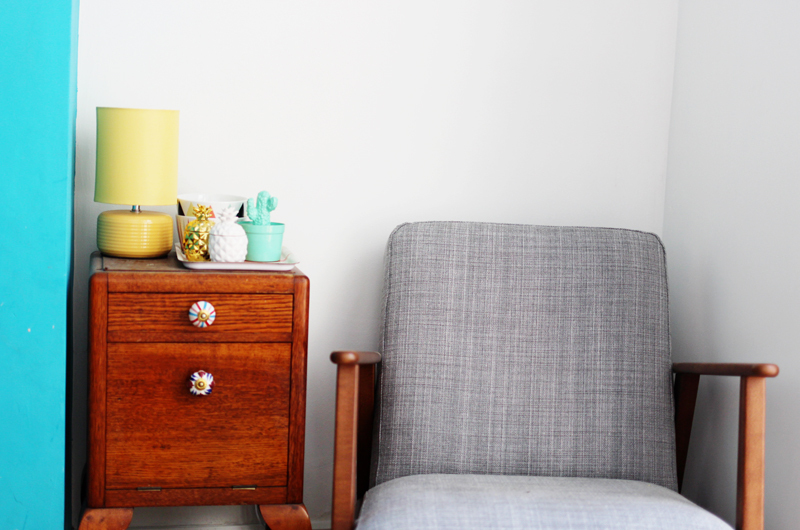 Whilst I loved how bright and calming this area is, I also wanted to add a few accessories to make it more 'us'. 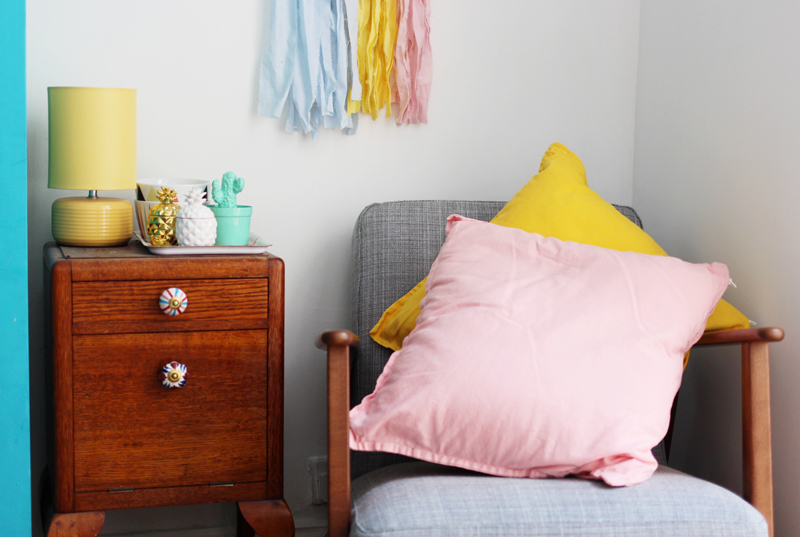 I'm working with DYLON on this post to show you how I have brightened up a little corner of my room by using a mixture of pre owned items, some plain cushions covers I picked up for a little over a pound each and three different colour dyes. So after experimenting with a few different colours I chose to stick to three pastel type shades. I picked the Powder Pink, Sunflower Yellow and China Blue. These three colours also reminded me of ice cream, which was a bonus! The image below is of a few different shades I was experimenting with and also my cushion cover and old sheet (the old sheet will come into play a little further down in this post). 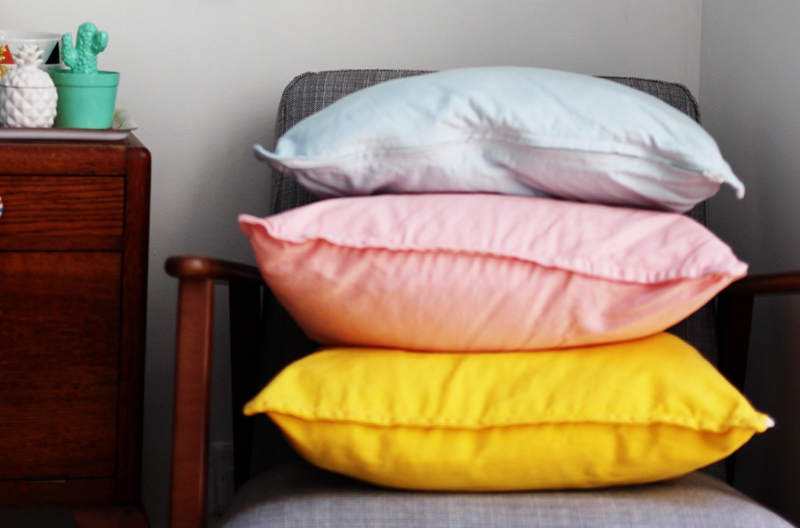 I started out with my three plain white cushion covers and one by one washed them with the separate dyes. The packet recommends using one box for a piece of material about the size of a duvet set so with just a small cushion I basically used about a tenth on the packet. So first of all you need to wet your cushion before placing it in the machine, I think this is so the dye sinks in consistently straight away. Next pop your dye in the machine and add the damp fabric and then give it a wash at 40 degrees. Once its finished you need to do a second spin and then you are done! I'm really pleased with how they turned out! 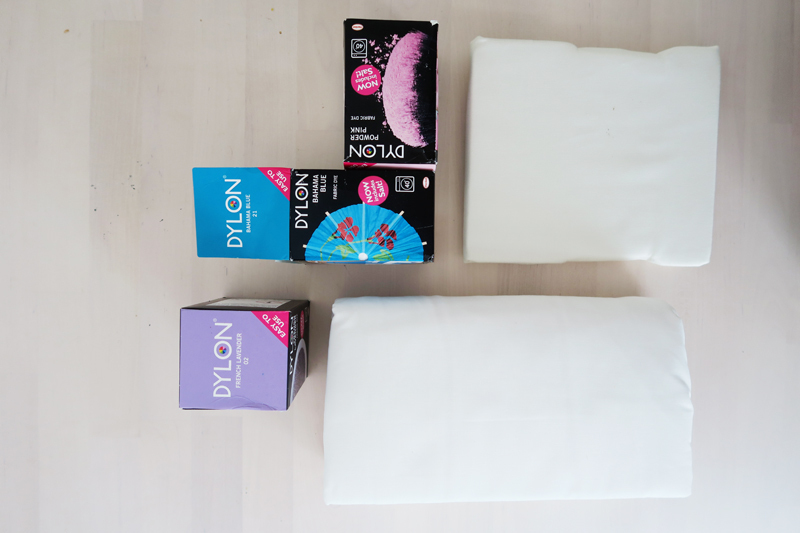 If you want to make sure that you get the exact colour on the pack DYLON recommend that you always use a complete pack and that if you want a lighter shade you just add in an old towel as well. 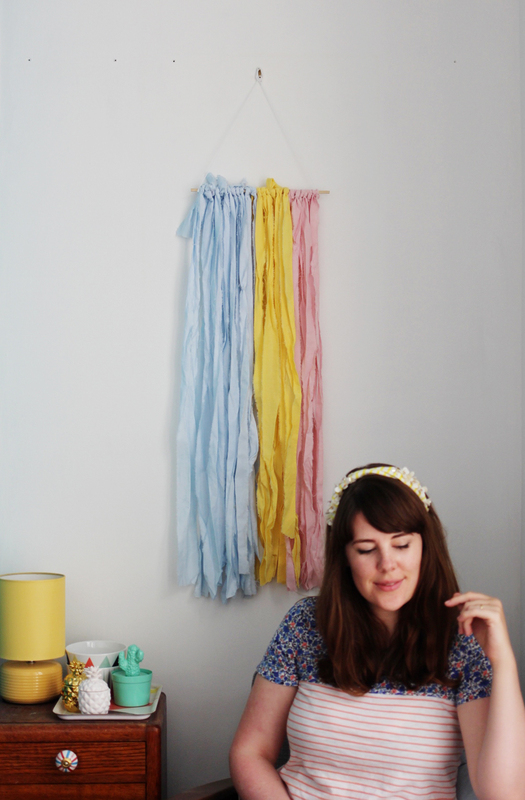 For the second part of my interior make over I chose to make a wall hanging with an old sheet I had. I cut the sheet into squares and popped about the same amount of dye that I'd used with the cushions and one by one dyed them the same three shades. The wall hanging was a bit of an after thought so really if I were to do it again I would just pop the old fabric square in at the same time as the cushion. 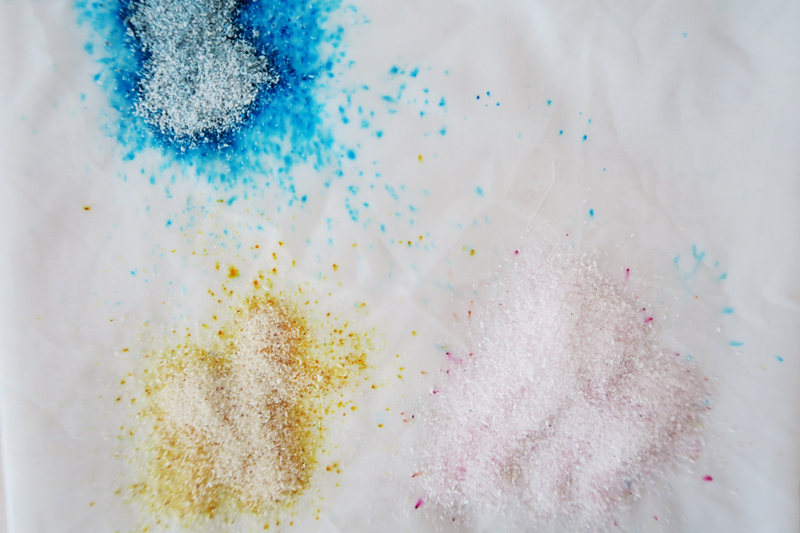 This is an example of what the dyes look like and how they take to the fabric. 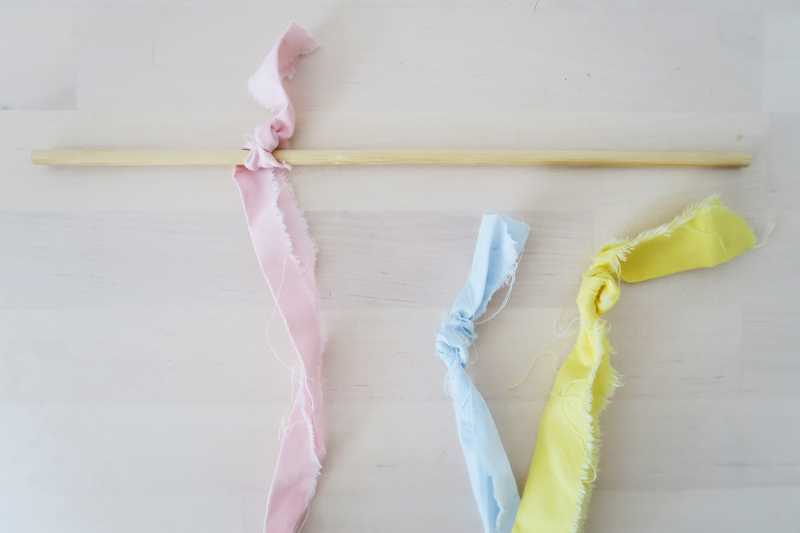 Once I had my fabric strips I tied them onto a small piece of bamboo cane that we had in Wilf's craft box, you can pick them up really cheaply from garden centres or even online. I love how the dyed cushion and wall art really help to freshen up this corner and make it more personalised. Both of the projects were completed in an afternoon so apart from the washing time its also a really time effective way to give your interiors a new look.